How to prevent Bed Bugs. If you have already been bitten by bed bugs you will want to know how to treat the bed bug bites. The next step will then be to find out how to get rid of the bed bugs that are already present or to how to prevent bed bugs from spreading to your home. Bed Bug Bites treatment and How to prevent Bed Bugs. If you have identified the bites on your body as the bites of bedbugs, then please read up on the various bed bug bites treatments below. First make sure that you will not be repeatedly bitten by identifying the bed bug source, possible a bed or mattress. Then, for the treatment of the bites look into either antihistamines or corticosteroids ( topically or systemically). Keep in mind that the treatment of bed bug bites is the treatment of an allergic reaction. 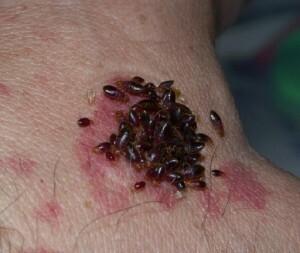 Some people bitten by bedbugs are not allergic and will not show any symptoms or have anu itch at all. Both can be bought online or usually at a chemist or pharmacy. And these will help in reducing the swelling as well as the itchiness. Bed bugs are able to be infected by at least 28 human pathogens, whether the insect is able to transmit the pathogens to a human is still unclear being. Bed bug bites are also called ‘cimicosis’. A bed bug epidemic is sweeping the US and Europe, and the prevention of bed bugs is becoming harder, as they are becoming resistant to many pesticides. The pesticides that have historically been found to be effective include: pyrethroids, dichlorvos and malathion. Bedbug infestation is not due to the lack of hygiene, a fact that also makes bed bugs difficult to prevent. 1) Bed Bugs and eggs can “hitchhike in” on pets, or on clothing and luggage. 2) Infested items can be brought in (like furniture souvenirs or even laptops ) . 3) Through nearby houses or flats, if there are easy routes (like through duct work or false ceilings). 4) Bed bugs from Wild animals (such as bats or birds). 5) People visiting your home from a source of infestation; bed bugs can be transferred by clothing, inside luggage, or on a person’s body. If you want to know how to prevent bed bugs, you must know their hiding places too. Often they are found in public buildings, like hostels, hotels and campsites. When they enter your home, they are often found where people sleep, as this is where they feed. So check your bed, mattress and your pets’ sleeping quarters. The can also hide in furniture, floorboards, in laptops, DSL ports, and other warm places. HOW TO PREVENT BED BUGS,WHEN TRAVELLING? If you suspect than some items are infested then keep them in a plastic bag until they can be laundered, heated or frozen. Bed bugs hate heat of more than 45 clesius (113 fahrenheit) and 15 minutes of such heat is usually enough to kill them. When washing the clothing, set the washer and dryer for the hottest setting that the fabric can withstand. 1) Spray your luggage with a bed bug spray before packing. 2) Bring a sleeping bag and pillow and sleep on the floor if you suspect your hotel room is infested by bed bugs. 3) Use luggage liners or pack your items inside a ziploc big bag and then place the big bag in your luggage to prevent bugs from entering your clothes. 4) Inspect the mattress for bed bugs when you arrive in a hostel or hotel. Look for brown or black marks around the mattress seams in your room. If none, you are ok.
5) Avoid keeping your clothes in drawers in a hostel and place the hanging clothes in your bathroom. 6) Keep your luggage elevated and zipped. 7) Buy a plastic anti-bed bug mattress cover and place it over your mattress in your hostel/hotel bed or at home. 8 ) Only bring washable clothes if you can. Wash all clothes on high heating setting when you return home to kill any bed bugs that may have travelled with you.. Bring dry cleaned clothes directly to the dry cleaner. 9) You can also try a natural bed bug repellent skin spray. These are not 100% effective though. 10) When you check into a hotel room, ask that you do not want to be in a room that was treated for bed bugs. Also, read online reviews of hotels with bed bug problems before you make your reservation. 11) Before you go to bed, apply a lot of body lotion with a strong fragrance all over the body. This can prevent the bugs from smelling human flesh and blood. Bedbugs are blind, so this can confuse them, although it is no guarantee, as bed bugs are also attracted by body heat. I hope this article helped you in learning how to prevent bed bugs. If you know of other ways to prevent bedbugs or if you have any experiences with bed bugs when travelling and staying in hostel or hotels, then please leave a comment below. Apart from the chemical treatment sniffer dig is the best choice to eliminate the bed-bugs. This technique is quite expensive but it will give you effective results too. All your suggestions are good but I think sniffer dog is also a good option to remove bed bugs. It is the modern technique to detect the bedbugs but it is expensive compared to others. So have a try of it!